We have recently interviewed a number of ‘illegal’ migrants from Pakistan to Austria (excerpts are up here and will hopefully soon be out in an English/Urdu version as well). When talking about the trip from Pakistan to Europe, borders played a major role. Crossing from Pakistan into Iran is not an easy task, being shot at, repeatedly sent back and waiting for days on the border until the next installment from the agent reaches the contact in Iran. From Turkey to Iran it is a foot walk through the Kurdish mountains, accompanied by silent armed guards before the geographical border to Europe needs to be crossed (either the Bosporus or the Aegean sea to a Greek island) and later on the national frontier crossing the Evros. Here there are the choices of crossing the river, taking a truck or taxi again or the speedboat over the ocean. You may listen to the best interview concerning the trip here in Urdu. Many countries have started erecting walls already. 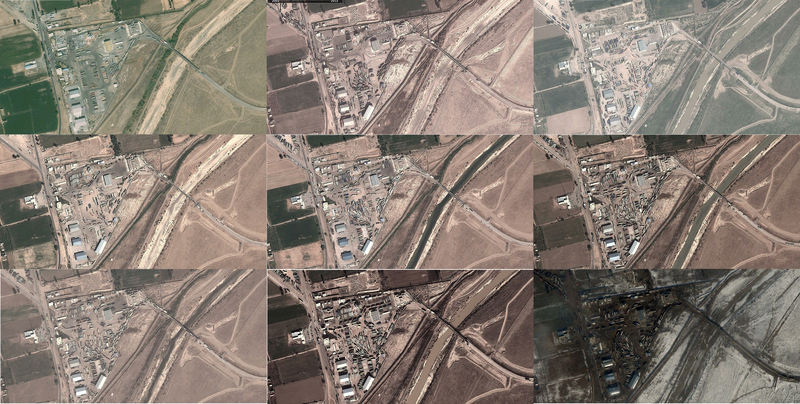 There is one on the Iranian side, along the Evros as well both visible from Google Earth already (other examples in this great Guardian piece). The business of building up such separations is lucrative, a book I recently reviewed for Tanqeed deals with this issue. The book Close Up at a Distance (Laura Kurgan, Zone Books, 2013) which looks at the history, politics and practice of satellite imagery as well as my use of such imagery during my work, spending time and again on Google Earth as well, prompted me to look at border crossings mainly in Central Asia. 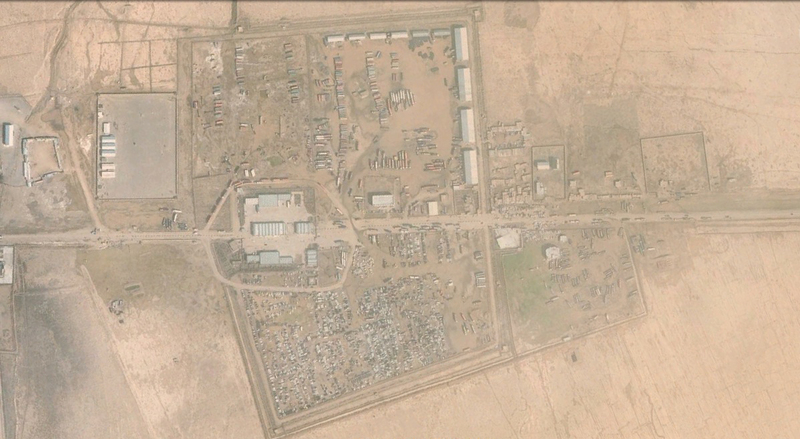 Not all border posts have good imagery on Google Earth, most notably Chaman and Torkham are unfortunately useless. Visually most fascinating are probably the lines of trucks that wait before customs. Considering that these are random shots from just one day, they give an idea of how intense traffic over these borders is each day – and with that, how many loopholes there are for smuggling contraband or people. 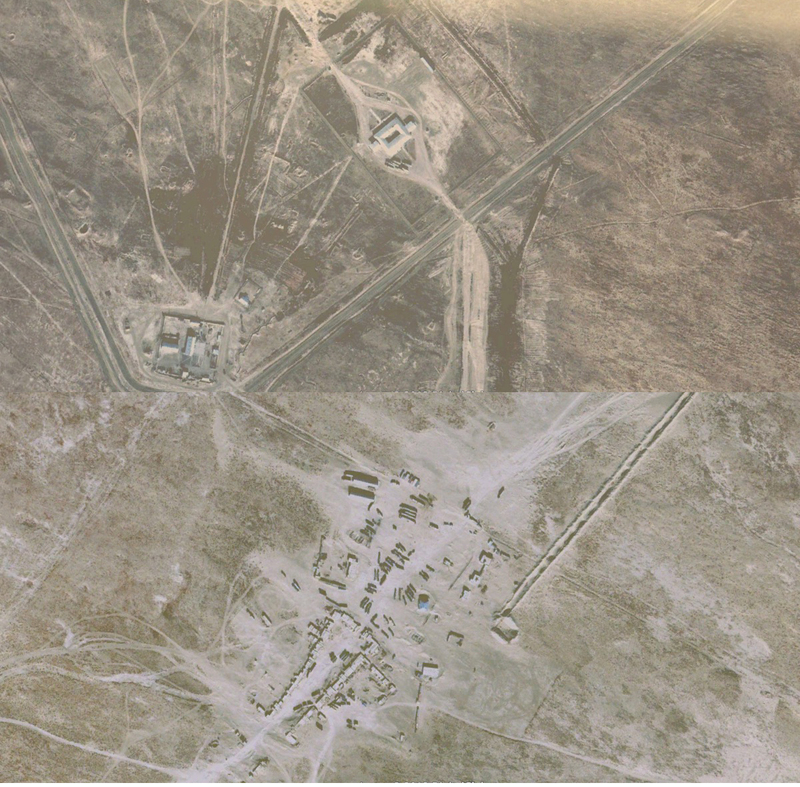 The scrap park north-east of the Taftan check post sees some change even between days (2012 in September and October two shots are available each). Trucks also do not linger here and also the yellow cabs are shifted regularly. Towards Afghanistan Iran has also constructed a wall, although probably less fortified and not as high. 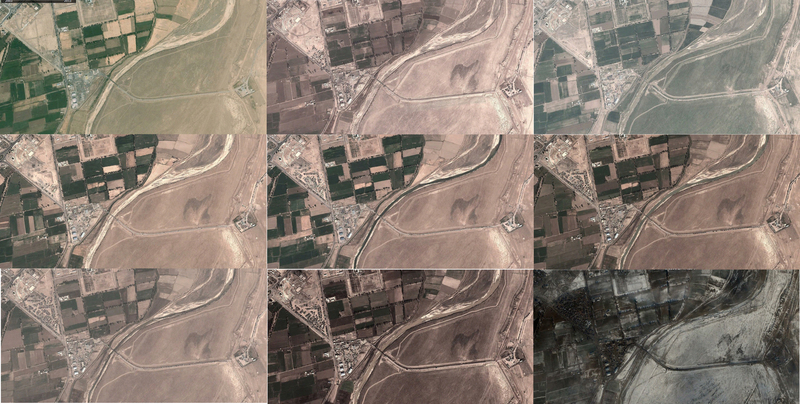 Above three images, Iranian Border Towers: (top) quadrangular border tower towards Pakistan, south of Taftan. The wall erected by Iran is visible towards the right. (centre) quadrangular border tower towards Turkey West of Bazargan, to the right something like a fence or ditch is visible. (bottom) triangular border tower towards Pakistan south of Taftan, again the border wall is visible. The border wall bewteen Iran (South) and Pakistan (North) just north of Taftan. The wall is only interrupted by a periodical river bed. Taftan is the only legal border crossing between Iran and Pakistan. Going north there is a small crossing in Sistan between Iran and Afghanistan between Milak and Zaranj. However since satellite imagery for Afghanistan is scarce and if available at bad resolution, it is impossible to judge remotely how this and other crossings develop. Only for the major crossing at Islam Qala an image is available for 2006. 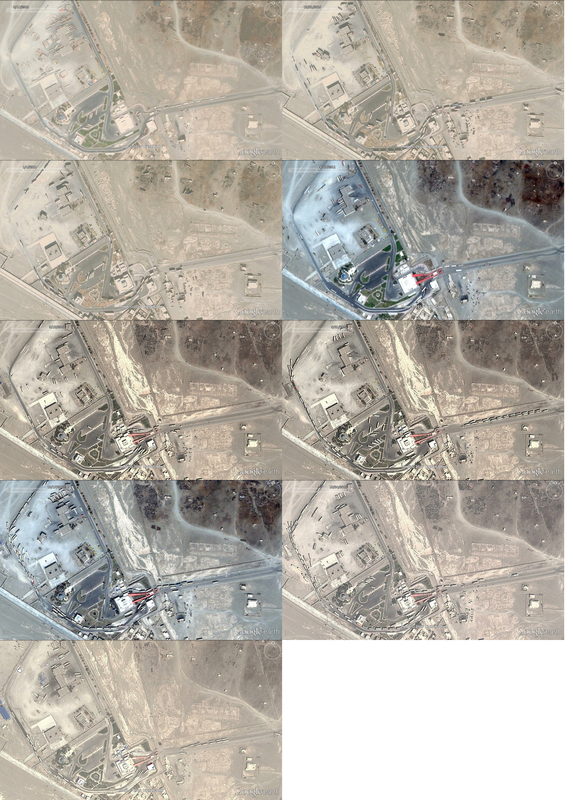 Above three images, Islam Qala Border Crossing Iran – Afghanistan (August 2006): (top) large view, left Iran with Trucks waiting, right Afghanistan with a huge car park. (centre) close up view of the Afghan sie. (bottom) close up view of the Iranian side. 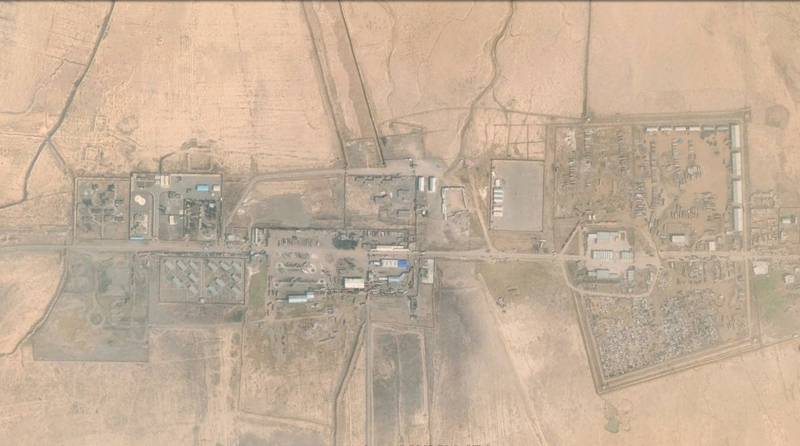 Other Afghani border crossings are less developed, see for example the Imamnazar post towards Turkmenistan below. Imamnazar border crossing between Turkmenistan and Afghanistan in 2002. Below is the Afghan side. Little is written about Turkmenistan at all, even less seldom does it surface in accounts of human smuggling. But relations between Iran and its northern neighbour are good and so it’s not surprising, that the major land crossings have seen some development in recent years (see below). Sarakhs also is the point where the major gas pipeline crosses the border. Both crossings, Sarakhs and Bajgiran are the best visual representation of trucks lining up like ants before the check post. In both cases lines trace back some kilometers both sides of the border and there seems to be little traffic of other cars. 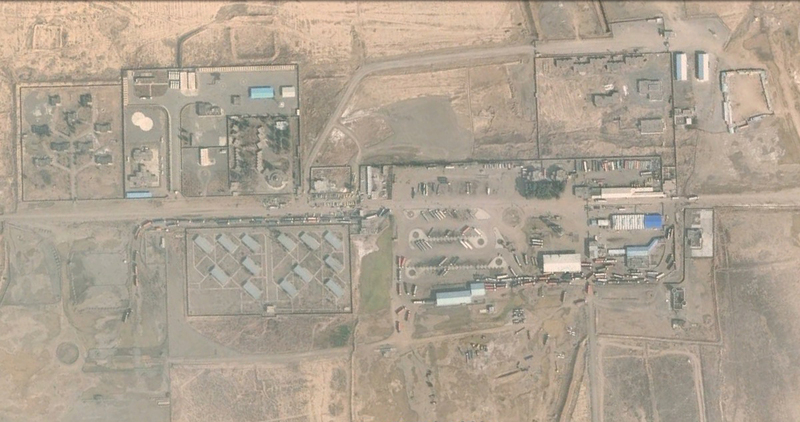 In Sarakhs in just a little more than two years a large trailer park has developed on the Iranian side. Bajgiran border crossing between Iran (South) and Turkmenistan (North). Images are from 2002, 2004 and 2010. 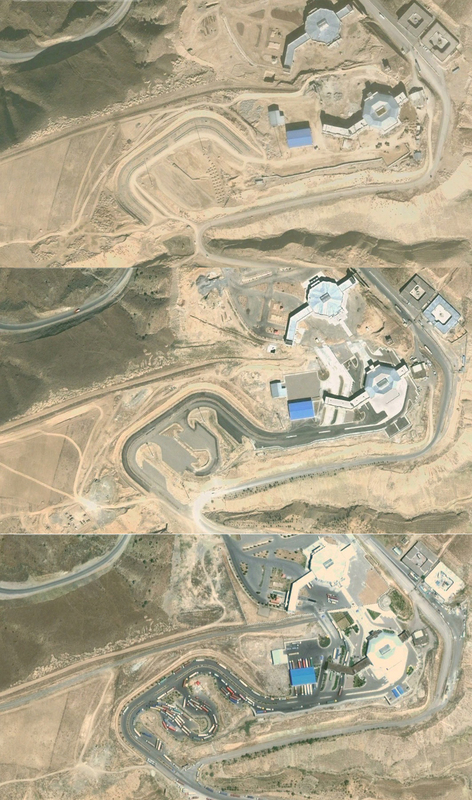 Above two plates, Sarakhs Border Crossing Iran – Turkmenistan (images from top left to bottom right are from February 2010, April, September, October (3) and December 2012 and January 2013): (top) large view, left Iran with Trucks waiting, right Afghanistan with a huge car park. (centre) close up view of the Afghan sie. (bottom) close up view of the Iranian side. In terms of border crossing development, on the far side of Pakistan another crossing has probably seen the biggest change. While in 2003, Wagah was little more than a road through lush Punjabi fields, today it has roundabouts on both sides and separate lanes for trucks. The development of the trade part of Wagah border (the stage for the ceremonies was already there in 2003) is symbolic for increasing attempts to reinvigorate trade between the countries. Even more exemplary of that is however the development of the road towards the Kasur – Ferozepur Road crossing further south. To date it is still closed but like Wagah has a ceremony. Less martial it is always less crowded and during the proceedings you are much closer to the Indian side. The crossing itself hasn’t developed, but Ferozepur road has turned from a country road into a two lane expressway. In 2005 still one way it turned into two lanes four years later and another two years later has white markings – a bit overdone for a road today mainly used by tractors. The Indian side seems less optimistic, there is nearly no change in infrastructure in recent years. 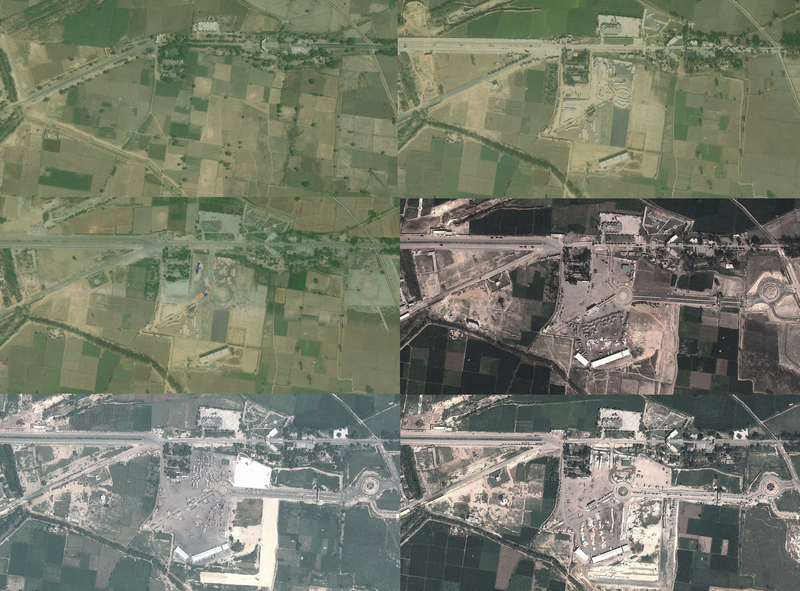 Wagah Border between Pakistan and India (images from top left to bottom right 2003, 2009, 2011, 2012 (2), 2013): The famous centre were the border closing ceremonies are carried through were already there in 2003. Infrastructure for trade has only developed in recent years. Ferozepur Road just before the border crossing Kasur – Ferozepur. Images are from 2003, 2005, 2009 and twice 2011. Returning to the main route of the migrants, the next crossing is between Iran and Turkey. Many cross the border here far away from the official posts of which there are some. The largest is between Bazargan (Iran) and Goerbulak (Turkey). Again, it is mainly truck traffic that is visible here. Goerbulak-Bazargan crossing between Turkey and Iran in 2011. The line of trucks reaches the far left side of the image into Turkey. 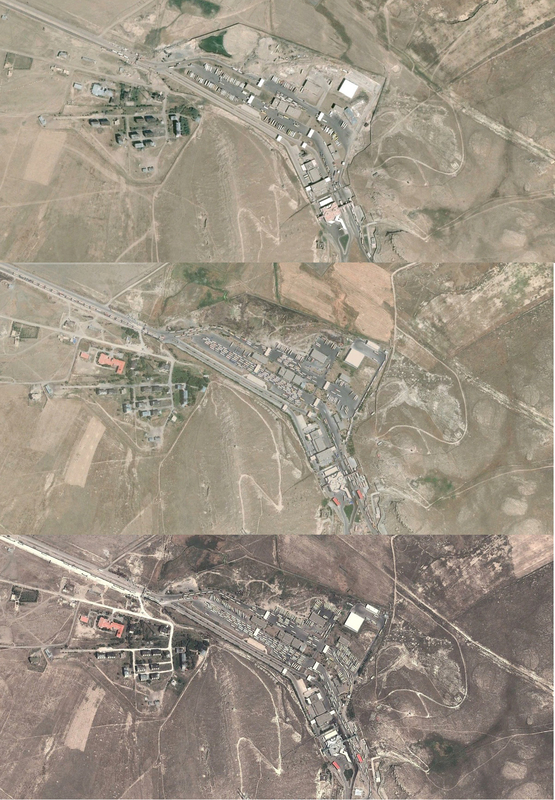 Goerbulak – Bazargan crossing in 2003, 2008 and 2011, always in August. Once the Bosporus and the streams of migrants from Pakistan, Afghanistan and Bangladesh join up with Syrians, Indians, Chinese and refugees from African states in Istanbul most try to reach Greece or especially recently with the influx from Syria Bulgaria. In above interview, you can listen how one Pakistani explains the options – ‘the different games’ as he calls them – to cross into Greece. One of them is to hide in a truck again and cross the border between Ipsala and Kipoi. 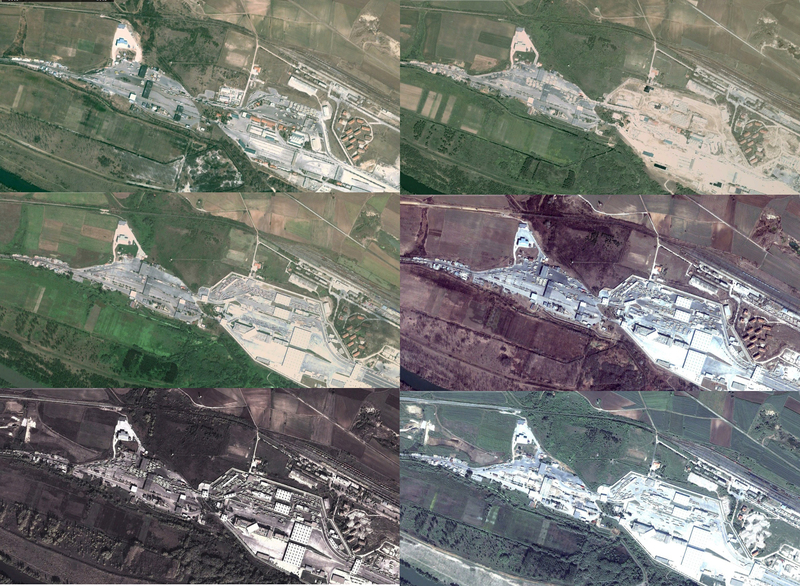 The Turkish-Greek border between Ipsala and Kipoi in 2003 (2), 2006 and 2012. Here a lot more private transport is visible than in Central Asia. 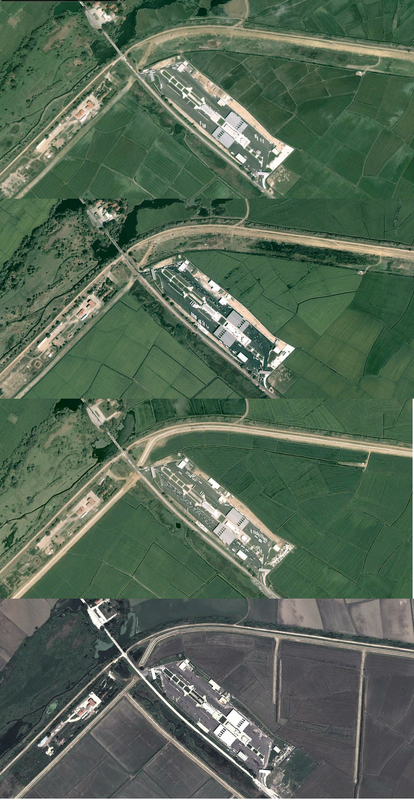 The Turkish – Bulgarian border between Edirne and Kapitan Andreevo between 2003 and 2013.